Remember when you were a kid and spent summers exploring backyards and canyons with your friends? Getting into trouble, coming home with cuts on your legs and discovering new things? When time meant nothing and adventure only slowed down for food or sleep? Well, guess what? Last weekend, I was a child again and it was amazing! 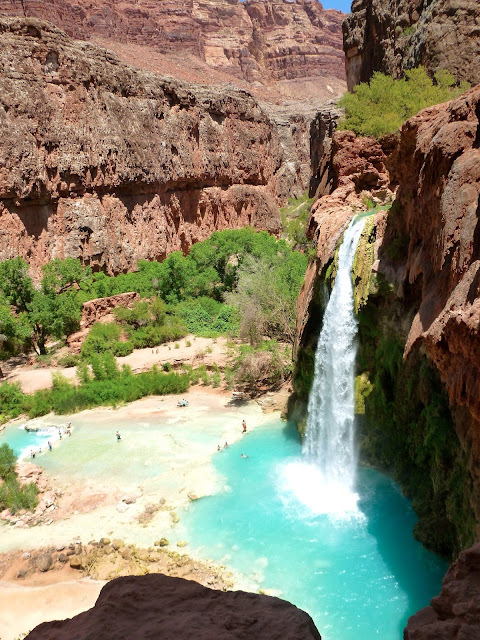 Havasupai Falls is located in the Supai Indian Reservation just outside Grand Canyon National Park in Arizona. It's literally an oasis in the desert that will have you exploring, adventuring, relaxing and enjoying endless fun in the sun to your heart's content. It's the most beautiful place I've ever been to. Our trip lasted 4 days. We hiked in on Friday morning, stayed the whole weekend and hiked out on Monday evening. Hiking out in the evening was nice as it allowed us to avoid the heat. For the last 2-3 hours we were hiking in complete darkness with nothing but a headlamp lighting our path. We were so focused on moving forward, there was no time to be afraid of the dark. We left our home in LA on Wednesday night for Las Vegas. We spent Thursday in Vegas, shopping for last-minute essentials and packing our packs. Then at 2AM on Friday morning, we got in the car with my sister-in-law and brother-in-law and made the 4-hour drive to the Hualapai trailhead. From there, it was a 10-mile hike down Hualapai Canyon to get to the campground. The hike itself was not extremely strenuous as most of it was fairly flat (or downhill--hiking out is another story) but it felt long, especially since we were carrying packs and hiking in the heat of the sun toward the end. For anyone planning a trip there, I highly recommend starting your descent at first light (around 4:30AM) to avoid hiking under the hot sun and also give yourself the best chance of securing a good campsite when you get there. There is also an option to have a mule carry your pack down if you'd like to lighten your load on the hike. About 8 miles into the hike, we checked in at Supai village. At this point, we were pretty tired and the sun was starting to beat down pretty hard, but we carried on because we knew we were SO CLOSE! The last couple miles were tough because it was so hot and we were just ready to be done, but soon enough we heard the rush of giant waterfalls and the amazing crystal blue waters that made us want to come to Havasupai in the first place was right in front of your eyes. All I wanted to do was dive down into the crystal blue waters to cool off, but we had to continue on to the campground to secure our campsite. Finally, we claimed our site and immediately stripped down to our bare essentials and jumped into the river right next to our camp. The cold water was so refreshing and felt so good on our sore muscles. We all just sat there for about an hour and rested. For the rest of our time there, the surrounding area was our playground. We did whatever we wanted, whenever we wanted. And we enjoyed every second of it, spending as much time as possible at each of the falls, even if it meant taking a nap in the shade next to them. We explored and adventured and rested and relaxed. Even though there are four "major" falls, there are also lots of pockets of surprises all around, waiting to be explored. To summarize, our time in Havasupai was amazing. Even though I was sick with a bad cold the whole time and completely lost my voice on Day 2, I loved being there so much. These falls and the whole surrounding area is just breathtakingly beautiful. It's so fun to live in your bathing suit, go exploring every day, jump around into different swimming holes and just enjoy yourself! By the end, I was exhausted and I'm still recovering from my sickness, but the memories of the falls are so magical in my mind. I feel like I've experienced a little gem of the earth that most people don't even know about and even fewer people have been to. 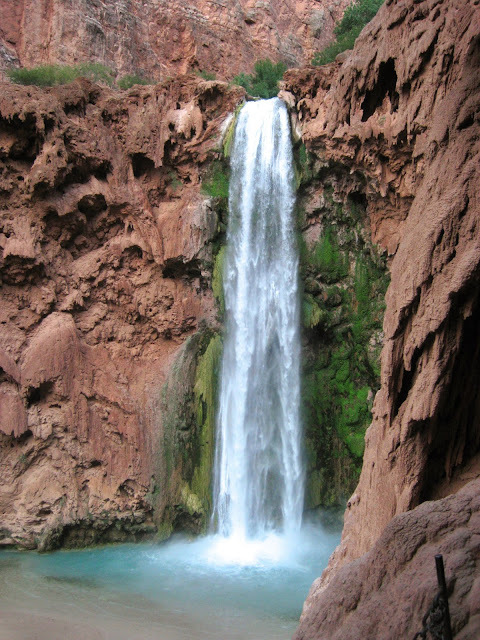 Havasupai is the most beautiful place on earth that I know of. To check out more pictures from my trip, check out my Havasupai Facebook album. For anyone planning a trip to Havasupai, I've put together a packing list of everything you'll need. This place looks magical! Just gorgeous pics!! Such a great recap, Catherine. Keep coming back to your pics and I am sure ill reference your packing list when we head that way. Can't wait! Definitely marking this place down for our potential "travel to do " list! Looks amazing! What an amazing trip! Thanks for sharing. We'll also be placing this on our "to do" list. This is amazing! You're packing list is right on, and you're pictures are amazing! this has been on my list of places to go forever! Someday. Looks awesome.